So you're travelling with baby. Bottles - check; infant formula - check; stroller - check; you've even packed your travel crib, good job! But there is one thing that most parents missed out on, or perhaps didn't even think of at all, and that is a portable baby high chair. 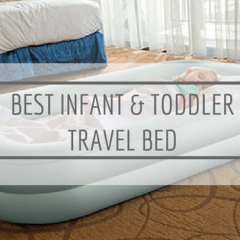 Yep, it is a travel essential in our opinion because it just makes life so much easier. It could very well be the most used baby gear out of everything else! Restaurants that do not have high chair (yes, there actually is quite a surprising number of these!)? No problem. Only flimsy high chairs with no restraints are available? No worries! Whip out your very own and insert it into any adult chair and there you have it - a safe and sturdy seating area for your little one to (hopefully) eat his meal quietly. Not to mention it is more hygienic this way, too! 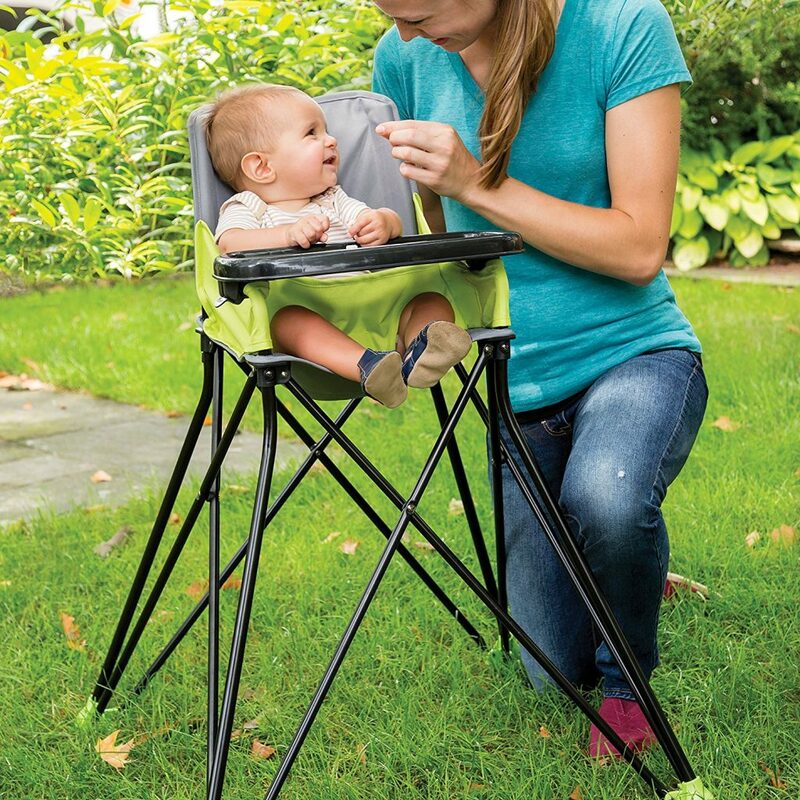 So we've convinced you to buy a portable travel high chair. What makes for a good one though? How do you know which one to choose? Weight - It goes without saying that a good baby travel high chair should be first of all, light. Who wants to lug around a heavy one when you have 10233940934 other things to carry across airports and hotels? Foldability - This will make packing and bringing out and about so much more convenient. Most hook-on seats will be collapsible so that's a plus, but keep in mind that they are not suitable for all surfaces. Size - Besides being one that your kid will be able to sit in comfortably, the overall design of a good travel high chair should be less bulky for ease of portability. Safety - Depending on your little one's age, you may want one that comes with restraints to keep him tuck in safe and snugly. If you're travelling with an infant, you may even need one with a 5-point harness. Ease of Use - You wouldn't want to be fumbling with buckles or straps or with folding each time you need to use it. You also want one that can be used on different types of surfaces because you never know what restaurants/places you will walk into! Easy to Clean - This is a no-brainer. 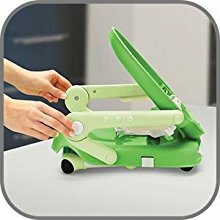 One fool-proof item in the messy department in that it is bound to get dirty (the difference being the level of dirtiness only), so it is important that your portable high chair is easy to clean. 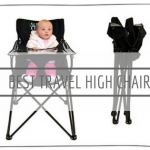 Usually, chairs that are labelled as travel high chairs have already taken all the above factors into consideration for travel convenience, and most would be a breeze to check in and travelled with easily. 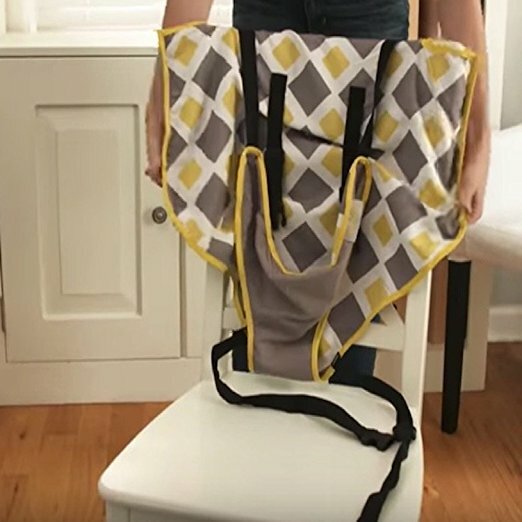 This is the lightest type of baby portable high chair which comes in the form of wraps in that you just pull it over the back of the chair and tighten to keep it secured. 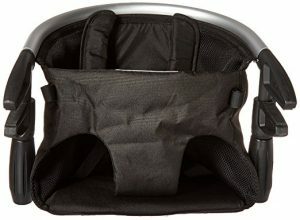 It is very easy to use and can be doubled up as a baby carrier as well so parents love it for its versatility. 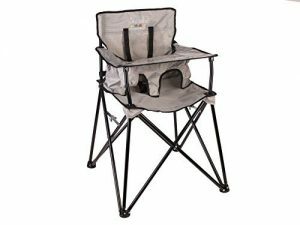 It doesn't hurt that it makes for the best folding high chair (literally takes seconds to pack) and therefore does not take up much luggage space. However, it may not be suitable for younger and smaller babies because there is not much elevation so that is a setback to keep in mind when you do your choosing. Nonetheless, it is the best easy clean high chair type out of all. As you can guess from its name, this is the type where you hook the chair onto the table surface using the attached handles and while they may not look like it, it is actually very stable once you've tighten the handles firmly. This type of high chair lets your little one dine on the same table with you and this is something a lot of parents love. 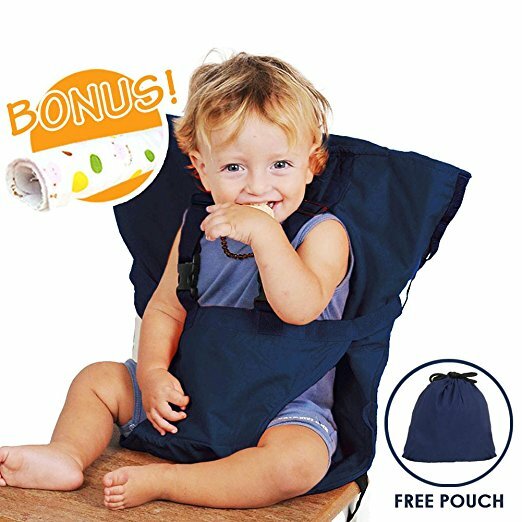 Most are collapsible which makes them a good travel high chair, however, with this type, you need to adhere to the weight limit because it will be dangerous otherwise since it is hanging off a surface, after all. No, this is completely different from the car seat boosters that you may be familiar with, although with similar function, and that is to elevate your child up. A baby booster high chair can be attached onto any chair with a back, with some having extendable legs so it can sit independently aside from catering to growing children at different heights. And because of this reason, although it may be bulkier than the other types, the booster seat is one of the most popular travel high chair amongst parents. You may be confused by the name and we don't blame you, but this is the type of high chairs that look exactly like the standard/conventional highchairs you have at home, but in a collapsible and much lighter form. 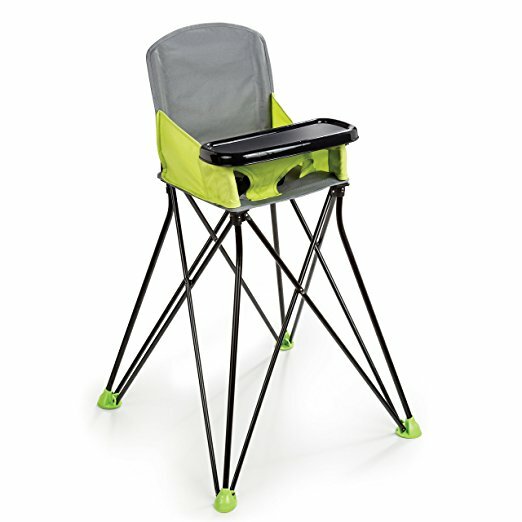 This type of highchair is very popular for camping because they give the height required without weighing you down (amongst your many other camping gears), but perhaps the biggest reason is because the above three types may not be that suitable, for example, the tables (if there is any) provided at your campsite may not be suitable for your hook-on highchair to attach to. Some people may call this type of highchair differently and strictly speaking, there is no specific distinction between portable high chair and travel high chair, but for our purpose in this review, we will refer these 'camping high chairs' as portable high chairs. The My Little Seat Travel High Chair is one of the best travel high chair in the form of wraps in that it ticks all our boxes - light, compact, easy to use and clean and best of all, comes with a 5-point harness. If safety is your only concern when it comes to wrap-style high chairs, you shouldn't have anything to worry about with this one because it incorporates a 5 point harness along with an extra reinforced seaming that has undergone rigorous safety tests for strength and durability. As such, it is suitable for babies who can sit unassisted approximately from 6 months up to 35 pounds, though you should keep in mind that there is no elevation from it. In terms of ease of use, just sling it over a chair with a back and that's it, setup is complete in seconds - it couldn't be any easier! Because of this, the My Little Seat will fit most standard chairs unless it is backless or if the back is really high, the latter of which is rather uncommon. Being machine-washable, you can clean it very often without any trouble. 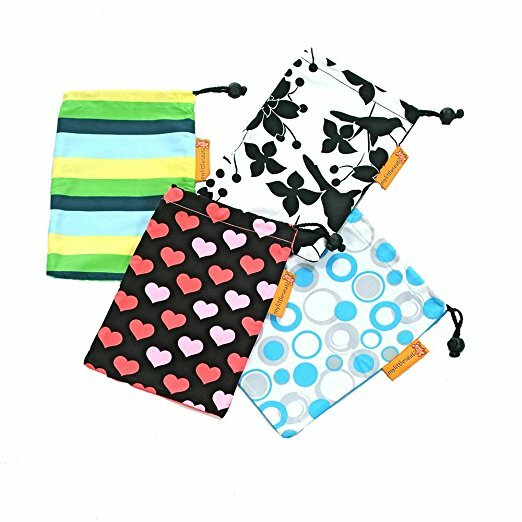 Being a wrap, it has the utmost benefit in being ultra lightweight and super portable as it folds down to the size of a diaper (and weighs like one too) which fit in its very own matching bag. It is so compact, it may go unnoticed in your luggage or handbag! It doesn't have to be just for travel - many use the My Little Seat Travel High Chair everyday at home or out for lunch with friends because not only is it very convenient, baby gets to sit at the same table like everyone else too. 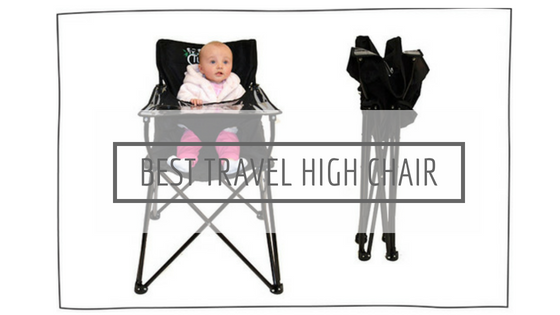 It is our ultimate top pick of wrap-style travel high chair at all times. 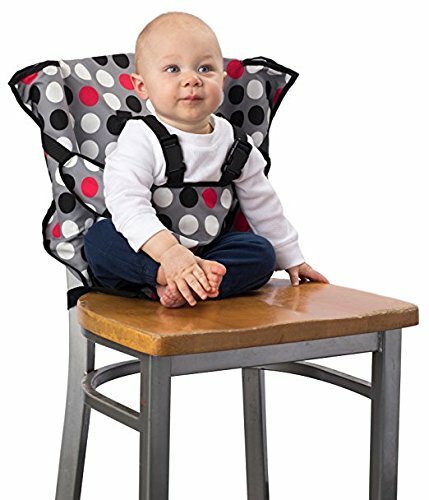 Another best baby high chair (wrap style) is the Portable Travel Baby High Chair from Baby Highchair Harness, a trademarked company. One of the things that we like about this travel high chair is that it is able to support heavier babies (up to 44 pounds) as opposed to the others' usual 33-35 pounds. Like My Little Seat, you can put your 6-month old in it once s/he can sit unassisted, and the strong shoulder horizontal belt, extended crotch and additional adjustable belt will keep him/her securely strapped on. Parents love how the adjustable belt ensures baby’s movement is not too restrained uncomfortably, and how chair belts are incorporated to let you fix it to the chair securely. 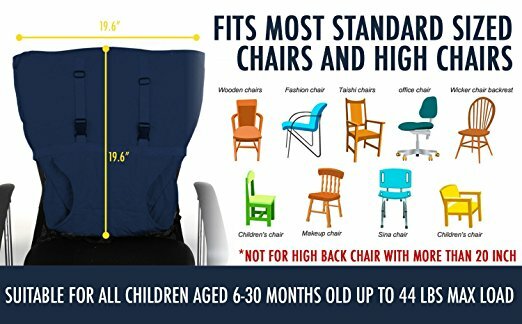 Speaking of which, you can fix it onto any chair with a back (click picture on the left to view clearly) but note that if the back exceeds 19" both in height and width, it may not be so comfortable for your child. Lightweight, compact, foldable and portable, the Baby Highchair Harness Portable Travel High Chair is one of the best affordable high chair in its category without compromising on quality and functionality. It is so popular, there are multiple counterfeits so make sure you buy from a trusted supplier to enjoy the genuine workmanship. Psst, you can even use it as a chair cover to protect it from food spill and stain as it is so easy to clean - simply throw it into your washing machine and you're done! Cozy Cover's Portable Infant Safety Seat - award winner of the 2015 Family Choice Awards for its Easy Seat's innovative and useful design is the last wrap-style baby high chair that we want to introduce to you. In many ways, it is very similar to My Little Seat - light, easy to clean, portable and comes with a 5-point harness. In addition, it comes with a strap for you to wrap around the back of your chair and you can join the two ends together in just "one click" before pulling to tighten as required. However, you must know how to thread it through a tension lock given to keep it tight, otherwise, the strap may come loose if your little one fidgets too much and that can be a potential hazard. 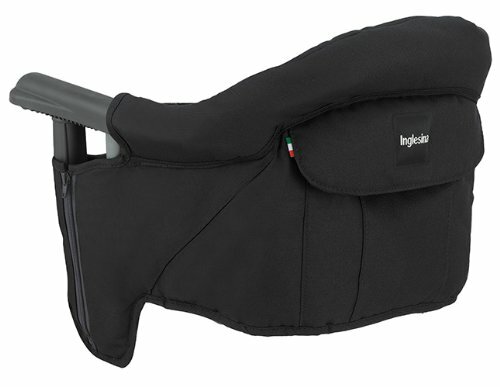 Done the right way, parents actually love how securely it sits onto any chair with a back because of the straps. It is very fast and convenient to setup - just slide it over the top of any quality strong chair and secure the strap as described above. 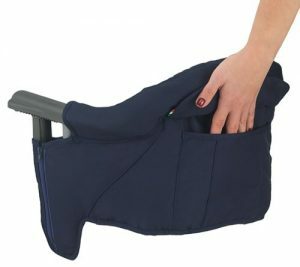 It is very convenient to bring the Cozy Cover Portable Infant Safety Seat out and about because it comes with a convenient light carry bag that will fit into any handbag or purse. And if it ever gets dirty (ha, who are we kidding! ), simply pop it into the washing machine and you can get it cleaned effortlessly. It is so affordable, many parents actually got at least two of them so that they can have another one to use while the other is in the wash. If hook-on high chairs are your preference, you will love the Chicco Caddy Hook On Chair. Designed in Italy and easily one of the most popular hook-on high chairs in the market, the Chicco Caddy is fuss-free and easy to use. Easily fits on table tops up to 5.5" thick with up to a 6" table skirting, you can practically use it anywhere globally. The rubberized hippo grips won't mark the tables or pinch your fingers, and the double-locking attachment system will put your mind at complete ease in terms of security and stability. What we really like about the Chicco Caddy is that it folds completely flat for easy storage and travel. There won't be any trouble fitting it into your luggage bag and weighing 7 pounds only, it will not add much to your limited luggage weight, nor be a pain to lug around at all. 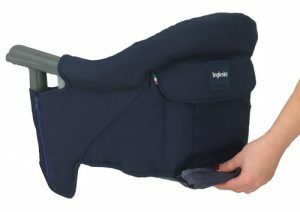 For baby's comfort, the seat is is made from fashionable, Italian-woven fabric that can be easily removed and hand-washed while the plastic or metal parts can be cleaned with a damp cloth and mild soap. Your little one will sit very safely strapped in by the 3-point safety harness. The Chicco Caddy Hook-On Chair is undoubtedly one excellent travel high chair to consider (there is a reason why it is so popular!) but it is worthwhile to check out the brand's other model - the 360 Hook On Chair that can have its seat lock in 6 positions, up to 360 degrees (and comes with a snap-on tray!) too if you have a bigger budget. Otherwise, you will definitely not regret getting the original Caddy Hook-On, the perfect travel high chair. If you're looking for a hook-on travel high chair with tray, we'd highly recommend the Inglesina Fast Table Chair. 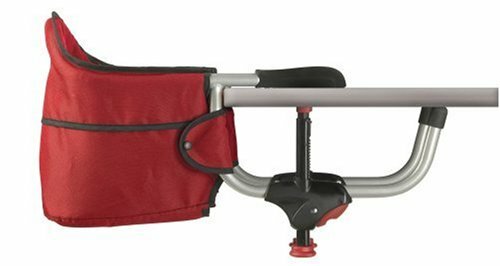 Even if you are not, this is one high quality portable high chair that you can consider besides the Chicco Caddy Hook-On. Parents who love this say that it is mainly due to its simple, twist-tight couplings and its compatibility with most types of tables (up to 3.5" thick) that don't leave a scratch behind. 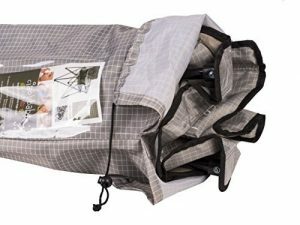 It is also ultralight at 4.2 pounds only (yes, we didn't think this is possible too before) and is collapsible (folds flat completely) so it is very easy to carry around comfortably. See the picture on the left? Where the hand is, is actually a large bag that is hidden underneath the seat pad and it comes with your purchase. Now you know why we say it is so travel-friendly to carry around! And right on top of that (at the back of the seat) is a handy rear pocket for you to store the small items (e.g. handkerchief, wipes etc). The Inglesina Fast Table Chair also uses a wider fabric than the rest to cover the tubes of the frame so it is extra comfortable for your baby to sit in, in addition to the lifted backrest and firm seat features. We do have to say that it is on the expensive side of hook-on chairs though, but considering all the amazing features including a convenient dining tray as an optional accessory (so your dining table wouldn't get too messy! ), we think it is certainly worth the extra money paid. Another travel high chair with tray that is highly rated by parents is the Phil & Teds Lobster Highchair, with its tray detachable for easy cleaning (dishwasher-safe). Super lightweight at under 4 pounds, thanks to its aluminium frame with padded back support and a shoulder harness system, the Lobster is probably one of the easiest hook-on highchairs to pack. Pick it up by the frame, and it literally falls into position, ready to be attached to your table. To pack down, just flip the clamps inward and it will fold neatly back onto itself, ready to slide into its own carry bag. Using super strong "lobster claws" with no-slip rubber grip pads as its means to attach to tables in a clamp mechanism, a 4-point safety harness with padded shoulder straps is incorporated to keep even the wriggliest of babies safe and secure in their high chair. The reason we rate the Phil & Teds Lobster Highchair lower than the other two is because it is not suitable for all kinds of table surfaces. While unstable tables are pretty much an understood fact (you shouldn't use hook-ons on any unstable surface in any case! ), the Phil & Teds is not suitable for glass top tables, tables with loose table tops, table leaves, single pedestal tables, card tables, camping tables, or tables with rounded or beveled edges or lips. This may be a hindrance to quite a few of you, with glass top tables and camping tables being the majority. Otherwise, it is definitely a good choice especially if you're after the lightest hook-on highchair possible! Among the many booster high chairs in the market, the Summer Infant Pop and Sit Portable Booster is the best booster high chair to bring about during travels or any out-of-the-house dining. This is because unlike others that are bulky in size (compare with the wraps and hook-ons), it is actually foldable, compactly in fact, as pictured left to fit into the carry bag provided for your convenient portability. And it's super lightweight to do so too! And you don't even need to sit it on top of any dining chair each time - simply pop it open on any even ground and baby can start eating anywhere, anytime. Once done eating, just remove the detachable tray (BPA free) and pop it into the dishwasher for a quick cleanup. 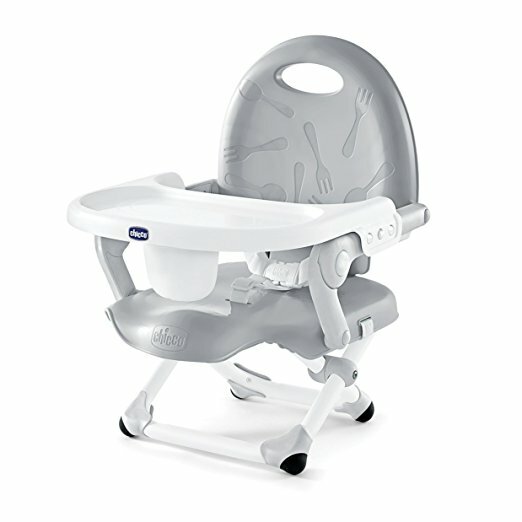 Of course, the Pop and Sit Booster can be seated on top of a dining chair so that baby can dine at the same table with you. Remember to use the safety straps provided to secure it safely to the chair so that it doesn't budge when baby moves around. Speaking of which, unlike wraps, you can use this on a backless chair too because the safety straps can be fastened under the seat. 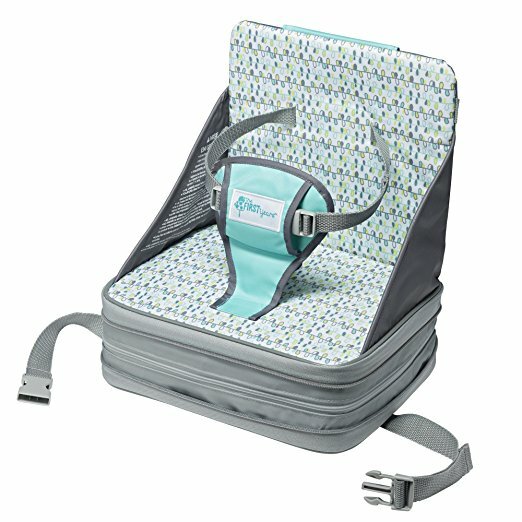 Chairs with a back -you can double the security of the Summer Infant Pop and Sit Portable Booster by fastening the straps both under the seat and over the back. And oh, did we mention it has a 3 point safety harness too? In terms of standard booster high chairs, we think The First Years On-The-Go Booster Seat definitely fits the bill as one of the best high chair booster seat. Your child will be amazed each time you pull this out of your mommy bag of tricks - pull out the valve and The First Years On-the-Go will self-inflate into a sturdy and comfortable full-size booster seat. When mealtime is over, just press out the air and fold down the back. Your little one will surely be fascinated watching you make this booster seat appears and disappears like magic! We especially love the adjustable height of up to 4 inches of this seat so that baby can always sit in a supported position. 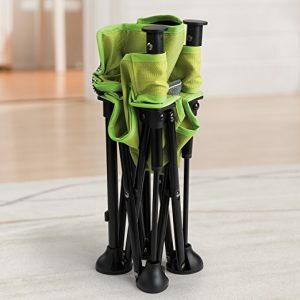 Don't be fooled by its look - it is one of the best foldable high chair in that it folds up into a messenger bag style with self-carry handle which is compact and lightweight (1 pound only!) hence easy to carry with you anywhere you want. The First Years On-The-Go Booster Seat is recommended for babies 9 months up who can sit unaided and the adjustable safety belt with T-restraint will help hold your child securely to keep him/her still and safe during meal time. Even if you don't use it for travels, parents love to keep one in the car for any sudden eating out occasions. 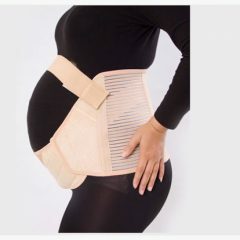 It helps that it is able to support babies up to 50 pounds, which definitely is a plus compare to the many 33-37 pounds. Another best portable high chair for travel in booster style we'd like to recommend is the Chicco Pocket Snack Booster Seat. Similar to the Summer Infant Pop and Sit in that it also has extendable legs, the Chicco Pocket Snack has an additional feature - its sturdy metal legs can be adjusted to three height positions. This means your little one can grow with this one, with having the seat sits flat without the legs at the last stage before s/he eventually outgrows the need of a highchair. In terms of portability, this travel high chair lives up to its category by having a push-button fold for convenient storage and compact travel. 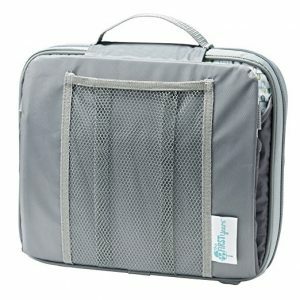 Add the carry strap, it makes for easy transport for on-the-go mealtimes. Likewise, it is very quick to set the Pocket Snack up and the three tray positions ensure your little one can always eat at a comfortable position (without having to bend over much), safely while they're at that with a three-point harness. Like the previous two booster high chairs above, this one here has two straps to secure it to most dining chairs as well (one across the back and another at the bottom of the seat) and the rubberize, non-marking feet adds further stability in keeping it from slipping. The colourful Chicco Pocket Snack Booster Seat is also one of the best easy to clean high chair because there isn't any fabric material - all surfaces are made of easy to clean plastic material which you can just wipe down with a piece of wet cloth. 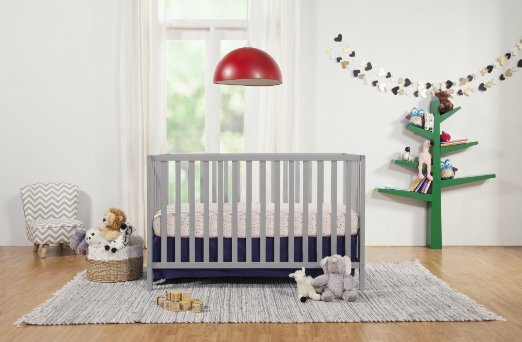 It is also very affordable, especially when you know it supports children up to 50 pounds so definitely a very worthy buy in our opinion! For the ones looking for a portable high chair that is tall and does not need to sit on an adult chair, our first choice is the ciao! Baby Portable High Chair that is perfect for picnics, camping, vacations or even grandma's house. With pop-open legs, this high chair has a lightweight and flexible design that unfolds easily, locks into place, and folds back up in seconds. With this type of portable high chair, you no longer need to worry whether the table surface is suitable to clamp on a hook-on highchair, or whether or not the restaurant you're going to has any backless adult chair. 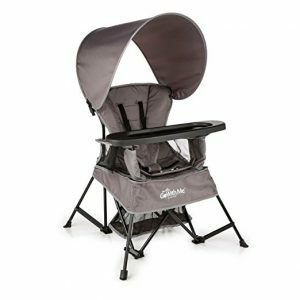 While it is heavier than other travel highchairs reviewed in this article, the ciao! is still relatively light which makes it easy to transport and travel with, especially when it comes with its own carry bag with shoulder straps that you can just hang over your shoulder. 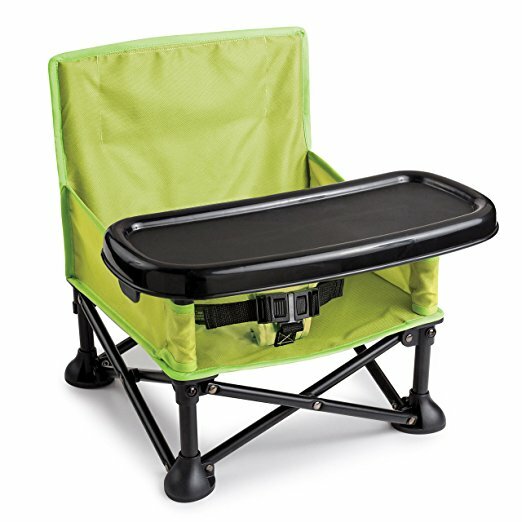 Such lightweight is made possible by the durable polyester/canvas material it uses in its construction, which also makes it easy to clean with just water (same goes with the clear vinyl tray cover and built-in cup holder) or wipe clean. If you do not want anything bulky in your house, the ciao! 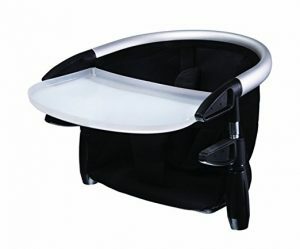 Baby Portable High Chair is a good substitution for the standard highchairs you'd normally see in the market because it functions exactly just like one, with the added benefit of practicality as well as convenient travelling but without the bulk. It is suitable for any children up to three years old, with a five point safety harness to keep them strapped in safely. Otherwise, for families that are always on the go or love outdoor activities together, look no further - this is the one for you! We will be honest - we are actually torn between the above ciao! Baby and the Baby Delight Go With Me Chair. As you can see, this one here has a sun canopy that is detachable should you wish to use it indoors, otherwise, having a sunroof while being outdoor is definitely a plus point in our book. In terms of portability, it is easy to pack up - just fold the chair up by pulling up the locking lever in the back and the chair, canopy and snack tray will all fit snugly into the given carry bag. Yup, no need to carry any item separately on one hand! What we really love about the Baby Delight Go With Me Chair is its versatility. Unlike most other high chairs that require baby to be at least 9-12 months old, it is able to support babies from 3 months up to 75 pounds. The 5 point removable harness makes your stable baby secure and comfortable as they sit upright in the seat, and as they grow, the seat can unvelcro to reveal two leg holes perfect for letting baby stand with support. The protective netting encloses your little one's feet and legs for protection from bugs, or rough surfaces, and when your child is ready, easily remove the 5-point harness for a Big Kid chair either with or without the snack tray. At the end of the day, if you're like us, torn between the ciao! Baby and the Baby Delight Go With Me Carrier, perhaps these few pointers will help you decide - do you need a standard tall size high chair so that baby can sit at the same level as you as you dine in or height doesn't matter? Are you going to use it mostly outdoors where sun protection is vital? Or price is the deciding factor? Either one you go for, we guarantee it is a purchase worth the money and you won't regret at all! The Summer Infant Pop and Sit Portable Highchair needs no further introduction - yes, it is basically the same as its Booster version which we reviewed above, with this one having longer legs for an extended height. Apart from that, this portable highchair version has no slip rubber feet that grip to most surfaces – tile, grass, hardwood – and its wide base offers maximum stability. Cater for 6 months up to 3 years or 45 pounds, the 3-point safety harness will keep your little one strapped in securely. Complete with a removable, BPA-free tray and over the shoulder carrying bag, the Portable Highchair version uses the same innovative pop and fold system that you can easily set up in seconds. Additional features include a rear storage pocket which let you keep essentials like bibs and napkins handy. All fabric parts are removable for easy cleanup in that you can just pop it into the washer or for quick wipe ups, simply do so by using a little soap and water. 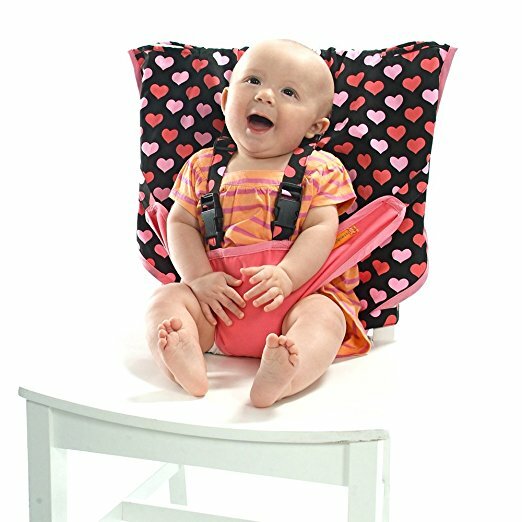 The Summer Infant Pop and Sit Portable Highchair is the cheapest portable baby high chair amongst the others reviewed in this category, one of the many reasons of its bestseller status for so many years aside for its durability and high quality that does not compromise on functionality and practicality. 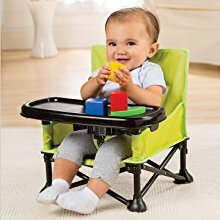 Travel high chairs don't have to be used solely during travels or out of the house outings - in fact, more and more parents have chosen to use one at home because it makes for the best high chair for small spaces (for example, wrap-style high chairs are some of the best space saver high chair out of all the types). It wouldn't take up any floor space at least, as opposed to standard high chairs which inevitably needs a space of its own. If you'd prefer the conventional high chair still, why not check out our review here to find out what is the best high chair in the market?